It's funny. I was watching The House with a Clock in its Walls the other day with my kids and something struck me. Isn't it funny how crass comedians seemingly find a second career as family-friendly film leads? The perfect example of this is Eddie Murphy who was as so vulgar and profane as a young comedian, but he turned that into kid-friendly fare such as The Nutty Professor, Doctor Dolittle and Shrek among others. Jack Black is another vulgar comedian who has found his niche making children laugh. 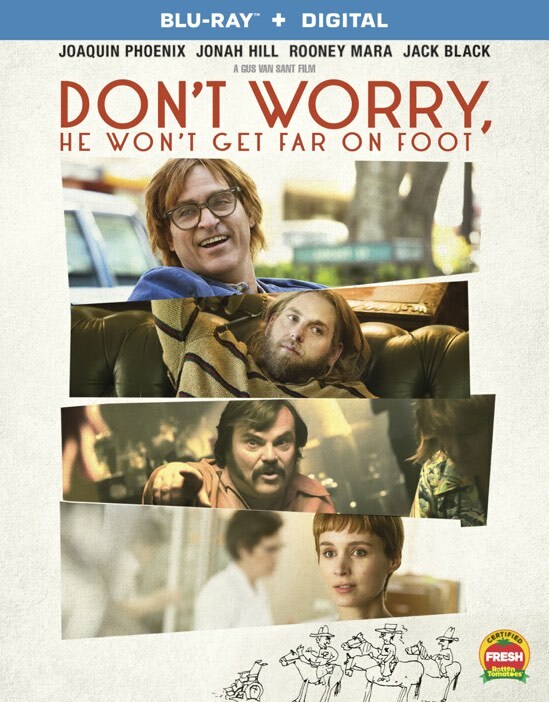 What does this all have in common with Don't Worry, He Won't Get Far on Foot other than having eight words in their title and starring Jack Black? Well, I think it's something John Callahan would find humorous. 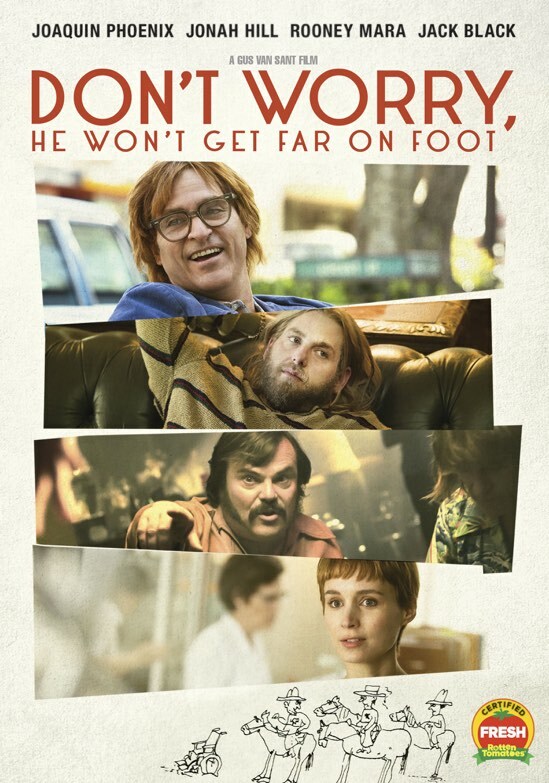 Don't Worry, He Won't Get Far on Foot is adapted from the cartoonist's autobiography and illuminates his real-life struggles with alcohol that landed him in a wheelchair. John makes the most of his challenges though and channels his dark humor into a prolific career as a controversial cartoonist. If you think that you're in for a saccharine tale about a man who overcomes odds to make something of himself, then you're obviously not familiar with John Callahan. He was brash and lived his life without apology and Joaquin Phoenix captures his spirit brilliantly in the film. Director Gus Van Sant treads lightly on traditional inspiration biopic cliches, opting instead to present a flawed man who knows that he's not perfect and quite frankly doesn't care. Robin Williams optioned the book in 1997 around the same time that he and Van Sant were turning in Oscar-worthy work in Good Will Hunting and I would have to think that he would be happy with the final product. The cast is top-notch and really compliments Joaquin nicely. Whether it's the aforementioned Jack Black as his drinking buddy and ultimately the cause of his accident or his A.A. sponsor played brilliantly by Jonah Hill, the cast blends in such a way that the whole truly is greater than their individual parts. Rooney Mara is also quite wonderful as his girlfriend that tries to help through the aftermath of the accident. But lest ye be warned, this isn't a straight-up inspirational drama. No, far from it, this is the story of a man with serious demons who learns to embrace them and channel them into his work. John Callahan never apologized for his controversial content and there's a lesson to be imparted by his determination to accept himself, warts and all, for who he is. At the end of the day, that's all that really matters, right? Sadly, John Callahan died in 2010 (spoiler alert?) and I can only wonder what he would make of the current political landscape sweeping our country. While there's a part of me that thinks he would simply shrug and keep on doing his thing, there's a bigger part that believes he may have truly found his groove satirizing the events around us. Don't Worry, He Won't Get Far on Foot is a satisfying film that presents an imperfect protagonist who learns to succeed by accepting his shortcomings. But it's the performances that will convince you to join the party. You really need to see Jonah Hill to appreciate how amazing his performance is. The trailer only scratches the surface and there's so much more to devour. Give it a shot, you won't be disappointed. Don't Worry, He Won't Get Far on Foot is now available on Blu-ray and DVD.